The final installment of Thursday night football in 2016 is a matchup between NFC East foes. While a win here would only strengthen the Giants’ grasp of the 5th seed in the conference, the Eagles have struggled in the latter part of the season, particularly struggling on the defensive side of the ball which was a strength early on. The good news for the Eagles is their offensive line is in a better spot last week with right tackle Lane Johnson returning from suspension. This should be an intriguing game to watch as the Eagles begin looking towards 2017 and the Giants try to get things sorted out before the playoffs. While the Giants are winning of late, it hasn’t been due to an explosive offense. While the Eagles secondary would recommend a favorable matchup, it’s hard to trust Eli Manning from a fantasy perspective in this one. The last time Manning threw for over 250 yards in a game was when these teams last met in week nine. This is a very nice option for the Giants as they aren’t solely reliant on their quarterback’s play, but it isn’t like they have an elite rushing attack either. Right now the Giants are rolling with a running back committee of Rashad Jennings and Paul Perkins which will be interesting to see unfold. Perkins is a player to keep an eye on as he has been impressive in recent weeks. It wouldn’t be surprising if he got more involved in the offense. Jennings hasn’t been very efficient with his carries this year, but figures to lead the two in touches tonight. He is a dicey option for a flex spot in lineups as the Eagles defensive line is still a strong point. 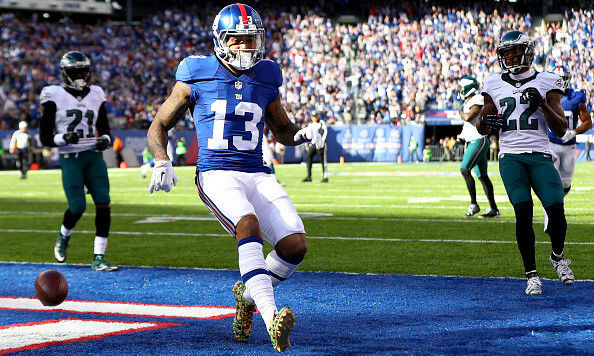 When looking at the Giants receiving corps, we obviously have to start with Odell Beckham. He has all the skills you would look for in a top tier receiver and has shown his game changing ability in recent weeks. Some of his yards can be dependent on how much he creates after the catch (his yards per catch is down half a yard from 2015), but figuring to see double digit targets he is obviously a must play fantasy option. Sterling Shepard has shown plenty of positive flashes in his rookie season, but from a fantasy perspective he is very touchdown dependent. This matchup is a nice one, but you’d probably need to be very confident in him hitting paydirt to put him in your lineup. Tight end Will Tye and Victor Cruz figure to see some targets, but neither should earn consideration in fantasy leagues. After a great start to his rookie season, Carson Wentz has come back down to earth. In his last eight games, Wentz has a 5 to 10 touchdown/interception ratio and has been sacked 20 times. He has also been throwing it early and often attempting at least 36 passes a game in that span. Against a strong defensive front, it wouldn’t be surprising if Wentz struggled in this one. The Eagles best bet to move the ball in this one might be through their running backs. Ryan Mathews is the primary rusher, and is coming off a very strong performance against a Ravens rush defense that is also very stout. Figuring that he sees 15 to 20 touches Mathews should be a solid 2nd running back for fantasy lineups. Against this defense however, Mathews’ value could be very touchdown dependent. The last time these teams played, Darren Sproles saw most of the work but that was likely due to the Eagles playing from behind early in the contest. While he could see his fair share of touches, his workload is an unknown to this point. I would say he is a solid flex option in points per reception leagues, but is more of a high risk/high reward in those leagues with standard scoring. While the Eagles don’t have a true number one wideout, there are a few pass catchers seems to favor. Jordan Matthews and Zach Ertz have both seen on average more than 10 targets a game in the last two weeks. Like Sproles, Matthews is a better option for leagues rewarding receptions as the targets are hard to ignore. Ertz is the higher upside option of the two and with the tight end position lacking depth, makes a better play in fantasy leagues. For the season the Giants have allowed 76 catches and 900 yards to opposing tight ends, meaning that if Ertz does see his targets, the production should be there. Trey Burton and Nelson Agholor should both have a handful of passes thrown their way, but neither should be counted on for fantasy purposes. This entry was posted in NFL, Picks against the spread, Week 16 predictions and tagged 2016 week 16 fantasy football predictions, 2016 week 16 predictions, Carson Wentz, daily fantasy advice, Darren Sproles, Eli Manning, Fantasy football, Jordan Matthews, Nelson Agholor, New York Giants, Odell Beckham, Paul Perkins, Philadelphia Eagles, Picks against the spread, Rashad Jennings, Ryan Mathews, Sterling Shepard, Trey Burton, Victor Cruz, Will Tye, Zach Ertz. Bookmark the permalink.